All this language for new chapters in fictional franchises adds up to one thing: more of the same. This is the age of the re-quel. Though prequels are common these days, the word has been around for decades. It’s first found in a 1958 article by Anthony Bouncher in The Magazine of Fantasy and Science Fiction, as Boucher refers to “a ‘prequel’ to Earthman Come Home.” The father of that word, sequel, has had an interesting life. Derived from Latin, sequel first turned up in English via the French sequelle in the 1400s, and it meant a group of followers or adherents, kind of like an entourage. From there, the word spread to other people and things that follow, such as heirs and parts of a logical argument. Along with those meanings, sequel can be found referring to continuations of stories as far back as the 1500s. Along with the various children of sequel — including rarer words such as interquel, midquel, and paraquel — the prefix re- is omnipresent in the world of movies, TV, and comic books. 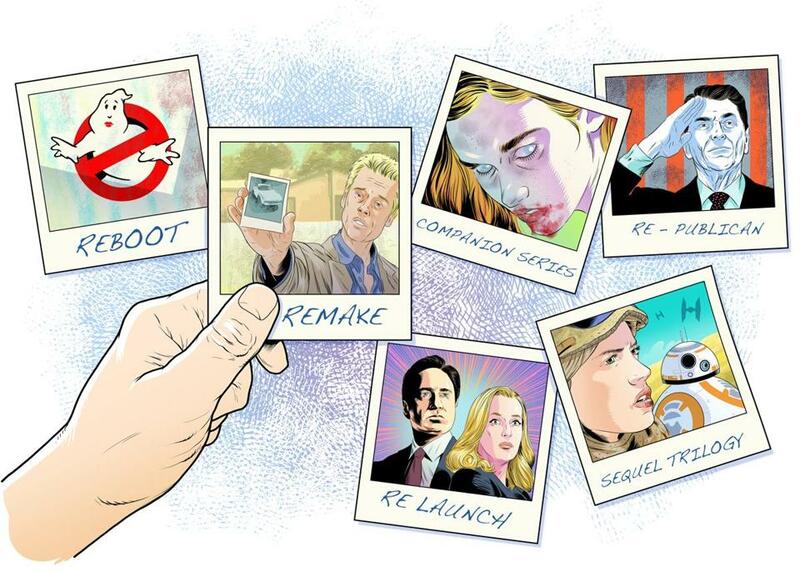 There are relaunches (like “The X-Files” picking up where it left off), reimaginings (a term often used for the second “Battlestar Galactica” series), and of course reboots. Reboot has been used as a verb since at least 1971, when the Oxford English Dictionary records an example from a programming manual about a command that “reboots the system by jumping to the read-only memory, which contains a disk boot program.” When a computer is rebooted, it starts fresh. By the late 1980s, the term as being used in metaphorical ways, as in a 1989 (Toronto) Globe and Mail article: “Computer retailer Canada Lease is still hoping to reboot its operation despite the National Bank of Canada demanding repayment of its debt.” These days, reboot is most prominently used for entertainment franchises, but the reboot is often a last resort, when there are no more sequels or prequels possible. As Baron notes, “Reboot sounds like you’re putting electrodes on a corpse and trying to reanimate it.” No one reboots an iPhone or franchise unless something is seriously wrong. Given the historical success of the latest “Star Wars” movie, such backwards-looking thinking is likely to continue and make a lot of people rich. Let’s just hope the powers that be keep greenlighting an occasional new idea or there won’t be anything left to reboot, relaunch, remake, rebrand, or otherwise recycle.